Will Missiles Fly before We See a LASTING Metals Rally? The U.S. may somehow still find a way to get involved in a nuclear exchange with communists 26 years after the collapse of the Soviet Union – even if it’s with a backwater country whose rockets tend to explode on the launchpad. The decades-long war of words with North Korea escalated last week. Most of us stopped paying much attention to the outlandish threats from North Korean dictators long ago. There have been plenty over the years as U.S. administrations, one after another, attempted to police the matter by applying sanctions directly and pressuring China to do the same. It is time to tune back in. North Korea’s apparent nuclear capability, of course, makes this situation different than many of the other wars the U.S. has been waging with Third World countries. But, the stakes are getting higher generally as other major world powers have begun pushing back. Our government’s attempt to overthrow Bashar al-Assad in Syria has pitted the U.S. against Russia. Now China is threatening to engage if the U.S. attempts regime change in North Korea. "If the U.S. and South Korea carry out strikes and try to overthrow the North Korean regime and change the political pattern of the Korean Peninsula, China will prevent them from doing so." 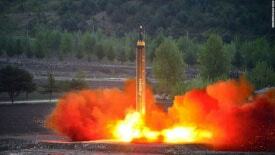 The Chinese have also warned North Korea’s leader, Kim Jong-un, against attempting a first strike. No surprise, China wants to avoid a conflict in North Korea which upsets the status quo and leads to even larger U.S. presence in the region. President Trump’s rhetoric on the matter has been a match for Kim Jong-un’s in terms of hyperbole. He tweeted the U.S. military is “locked and loaded” Friday. If North Korea performs another missile test, or attempts an actual strike, the president is building the expectation he will act. That makes it harder to walk back. Noted author and economist, Jim Rickards, sees war with North Korea as “almost inevitable.” Kim Jong-un and Chinese leaders are misreading the U.S. posture as a bluff, and will overplay their own hands. He believes Trump and the generals advising him are not just talking tough – they are ready to act. If markets continue to take the threat seriously, we’ll see more bidding for safe-haven assets including gold and silver. The recent pattern has been for momentous geopolitical events to fade quickly from investors’ memory, however. Stock market futures were recovering Monday in early Asian trading, while gold and silver prices were under pressure. So, despite the geopolitical drama and growing threats of war, it is still quite possible investors will wait until missiles start actually flying before taking this threat seriously.